Each June, GLAA publishes our annual Membership Directory. 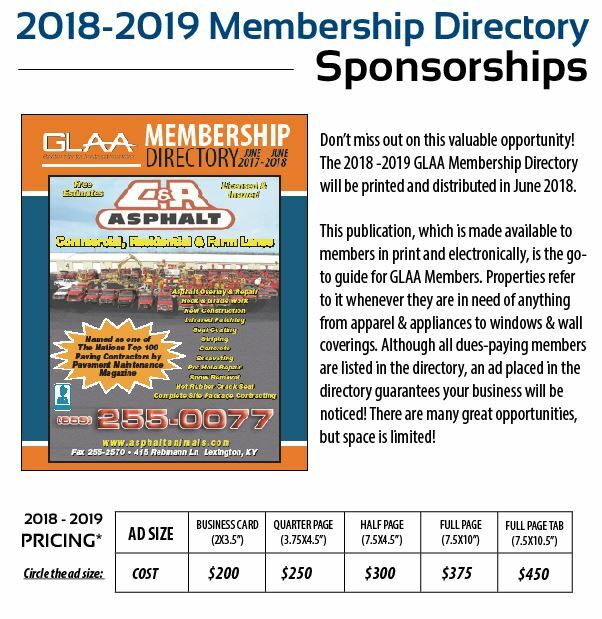 The 2018 -2019 GLAA Membership Directory will be printed and distributed in June. This publication, which is made available to members in print and electronically, is the go-to guide for GLAA Members. Properties refer to it whenever they are in need of anything from apparel ​& appliances to windows & wall coverings. Although all dues-paying members are listed in the directory, an ad placed in the directory guarantees that your business will be noticed! There are many great opportunities, but space is limited. Don’t miss out on this valuable advertising opportunity! ​to you in regards to your artwork.